Ionics to officially release a new system, the ZeRO PPB that produces pure water at 0 parts per billion! Pure water………. but 1000 times purer! There is a reason why I have a set of ladders on my van. It is because, of course, we still do some ladder work on residential. Strange that when you consider I have van mounted systems that can deliver hot as well as cold pure water. Not forgetting the trolley system and the spare 25 litre barrels I carry for it. So why do I have the need to do an entire house on ladders when I have all this kit? Firstly, my ladder is just another tool in my window cleaner’s toolbox. When you speak in the forums it is clearly divided by the window cleaner who chooses the WFP and those that choose ladders. And they use WFP or ladders exclusively. I don’t agree with that. I say, use whatever means to do the job which gets the job done right and that safety must be your priority whether on ladders or not. The reason is simple. Even though we use WFP’s, we are winning work from other WFP operators and then told by theses customers not to use this process! They want the traditional way! Why is this? You could say, ‘ I will walk away from jobs like that’. But I do not think that is the answer. The reason the customer sometimes demands this, is because the last WFP window cleaner left spotting on the glass. Spotting comes in varied degrees, some of which is hardly noticeable and you ‘get away’ with it. The truth is – if your water has not been checked, flushed or cartridge changed at the right time. Or you don’t rinse off as well as you should, or your rinsing a lot but the dirt keeps bleeding out of that dirty vent, your water quality will be poor and so will be the cleaning quality. Some window cleaners boast they can clean windows with water that runs a TDS reading of 008 and above! You might be safe for a while if the glass you are cleaning is ‘friendly’ (hydrophilic glass), or you clean it on a more frequent schedule. You’re lucky. Fact is, for pure water to work properly with no spotting it needs to have a TDS of 000. It’s so easy to get complacent and let the TDS reading rise. You are never around to see a customers windows dry. So how do you know for sure your doing the right job? Getting back to that customer I mentioned earlier, the one demanding that they have their windows cleaned traditionally because of previous poor WFP work. This customer is now difficult to turn around. It is possible to switch them later but it will take time. This brings me around to Ionics. Ionic Systems will be launching their new ZeRO PPB System. The tech coming out of the Ionics camp is awesome at the minute. This new van mounted system promises spot free results even on first cleans, using less water (rinsing time, so you will get more work done too) and has lower running costs. What makes this system so awesome? The answer is simple and the give away is in its name. You see this new system produces water at 0 parts per BILLION!! Think about it, what does 0 parts per billion mean? It means fewer impurities in the water, which in turn means more dissolving capacity of the water. Imagine a first clean with no spotting. Imagine any clean with no spotting. Then imagine no window cleaners on ladders. Of course let us not forget that your skill as a window cleaner using the WFP is a factor and also the amount of dirt and debris you need to clean. More dissolving capacity in the water is claimed to assist with the perfect result. The tech idea and science around this system has my vote and I can’t wait to trial one. Hopefully this may be an answer towards less disappointed residential customers ( who knows) that in turn will mean less window cleaners having to take to ladders or jobs lost? Thanks for reading my thoughts – shot from the hip! I will of course update you on information as it streams in. ← The business of cash collecting on your window cleaning round. You said that the customers who don’t like wfp because their previous cleaner left spots,because he was either using non pure water or because dirt keeps on dripping from the vents/brickwork etc. But if they use water at 000 then this problem will be resolved, and to use water that is a thousand times cleaner than the 1 in a million we now use will give a better result, especially of first cleans. Like everything it comes down to skill and proper care and attention in cleaning windows, yes you need PURE water, but having purer water will not give a better clean. I do not use ro instead I am lucky to be in a soft water area, so I di my water, but I have cleaned windows with readings of 20ppm and they have been spot free. But I have also done builders clean using 000 water and there are spots galore, I think that using 1 in a billion of water will stil leave spots on these type of cleans, Instead I clean all the sand and dirt off the glass first with MDR and them clean with pure water and the window are clean and spotfree. Having purer water will not make a bad cleaner good. Hey William. No – I wrote that we won residential work because of spotting issues from the previous window cleaner. Poor work has a number of factors, water quality is one of them. In the article it does not say that having purer would make a bad window cleaner, good. There are many people who do not like change, and when new ideas method come into use, they still want the old way. When they found that the earth was not flat but round and you would not fall off the edge, you still had the few who believed it was flat. The same applies to wfp cleaning, I think that every single wfp cleaner has lost customers because their customers want the old way of cleaning, I lost loads 10 years ago when I first started and when wfp use was in its infancy, I lose a lot less nowadays. Some of these customers in my early days could have been unhappy with the results, mainly because I made mistakes, but over time I have got better. But I still lose the odd one or two and I have asked if they are unhappy with the results, and the honest ones say no the windows are fine but I PREFER the old method. These you will never convince and I wish them well, on the other hand I have picked up work from bad wfp cleaners and ladder cleaners and these customers attitudes have changed to wfp cleaning because, I do a better job. 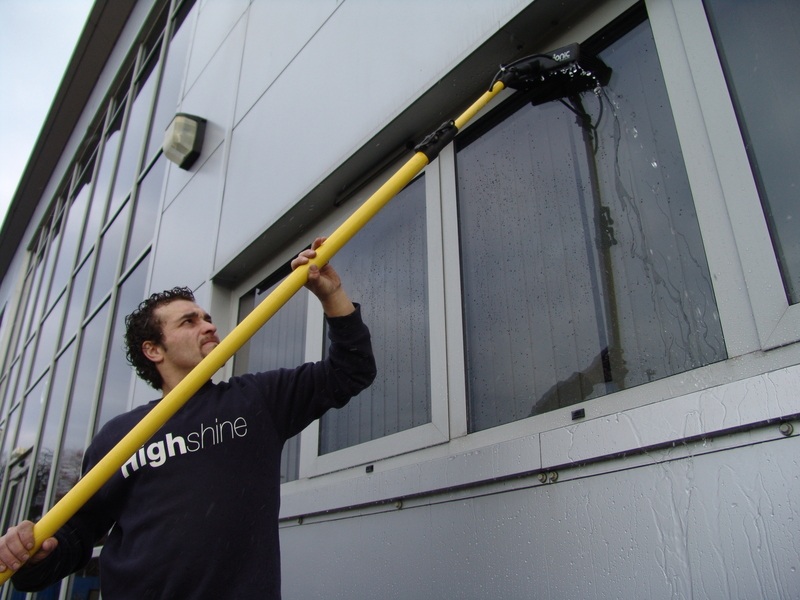 This new system might though have benefits for window cleaners on cost or time saving and if it improves the envoirment impact on waste water or water used, then this will be a good thing. But it all comes down to price and knowing Ionics I feel the cost will be too high.